Phoenix area solar home sales continued to increase in May according to recent data from the Arizona Regional Multiple Listing Service (ARMLS) from May 1, 2016 to May 31, 2016. There were a total of 157 verified solar home sales in Maricopa County for the month of May, up from the 135 confirmed sales in April. Homes with a solar leases (whether monthly lease payments or prepaid monthly solar leases) accounted for 102 of the 157 sales (65%) while homes with solar owned electric systems accounted for the balance of 55 (35%) of the Phoenix area solar home sales in May 2016. The median price for a solar home in Phoenix dropped to $265,000, down from $274,900 in April. Leased solar homes had a median price of $262,000 (down slightly from the median of $265,000 in April) while the median price for a solar owned home rose to $296,000 in May from $291,000 the month before. The median price for a single family residence under $500,000 in Maricopa County in May was $240,000, up $5,000 from April 2016. The median days on the market for a resale home in Maricopa County was 42 days again in May 2016. Solar in general stayed within reach of the average market with an median time to sell at 46 days. Phoenix homes with a solar owned system took less time with an average of 43days while Phoenix area homes with solar leases took 50 days. The average days on the market for a solar home in Maricopa County was 64 days versus a market average of 60 days (solar leases had an average market time of 66 days while solar owned was 61 days). Almost two-thirds of the total solar home sales in Maricopa County were in APS territory (67.5%) while the remaining 32.5 percent of the solar homes were within SRP territory. SRP solar homes sold in 58 days versus solar homes selling in 46 days in APS territory. The median price for a solar home in APS territory was $280,500 and SRP territory was $246,900. Mortgages helped finance 80.3 percent of all solar sales in the Phoenix area in May, down slightly from the previous month. Conventional financing (Fannie Mae and Freddie Mac mortgages) accounted for 45.2 percent of the total solar home sales in the Phoenix area while FHA and VA financing total 24.8 percent and 10.2 percent respectively. 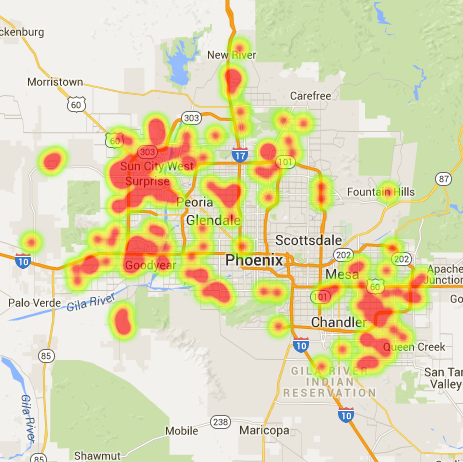 Cash home buyers purchased 19.7 percent of the total Phoenix solar homes for sale in May. Sellers contributed towards buyer’s closing costs in one-third of all sales (34.4 percent). The typical solar home sold in the Phoenix area in May was a 3 bedroom, 2 bath home with 2,087 square feet on a 7,693 square foot lot. The solar home was built in 2003 and had a 6 kW solar array on the roof. NOTE: Only resale single family residences that sold during the month of May 2016 in Maricopa County with a sales price of $500,000 or less were used in the analysis (non-luxury market). Properties priced over $500,000 fall into the luxury category and were not used in this analysis. All sales were verified to have a solar electric (solar PV) system that was owned outright by the home owner or had a solar lease. While all attempts were made to ensure quality and accurate data, I am limited by the data reported (for example, only 21 percent of listing Realtors actually inputted the size of the solar system). Homes with only solar water heaters or solar thermal pool systems that did not have a solar electric system on the roof were not included due to the extreme differences in these types of systems.